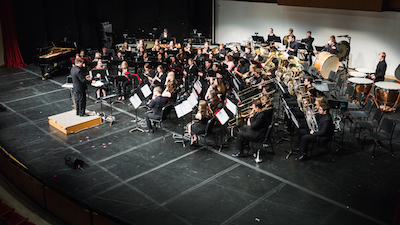 The Campus Band is the university's largest concert band. Its select mission is to provide a high quality performance venue for musicians representing a wide array of musical backgrounds and major fields of study within the university. The objectives of the Campus Band are to provide an opportunity for instrumentalists of diverse abilities and interests an opportunity to perform quality literature, and to hone their technical and musical skills through the rehearsal process; to provide a laboratory environment for music education students to gain vital performance experience on secondary instruments; to encourage members of the university's athletic bands to maintain a high level of musical activity throughout the year; and to serve as a resource for music educators and aspiring teachers through the study and performance of high quality repertoire appropriate for developing ensembles. The Campus Band rehearses and performs in the spring semester only. The two sections of Campus Band rehearse one night a week, either on Tuesdays or on Thursdays, from 6:30 to 8:20. Membership in the Campus Band is open to any member of the university community, and music majors as well as non-majors are encouraged to join. There is no audition required. For instrument rental contact Charlie Leftridge. Contact Douglas Bush for additional information.